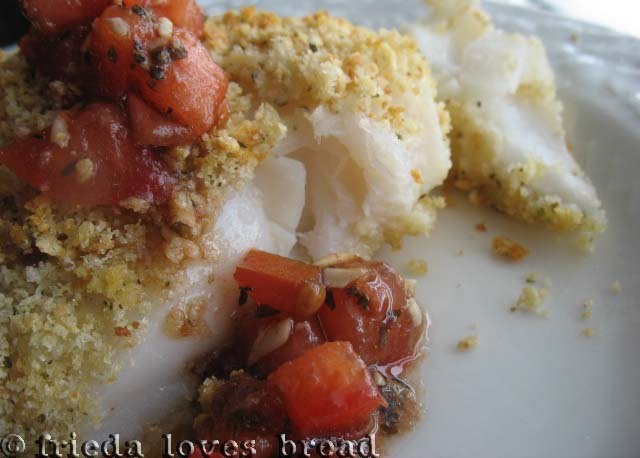 Long ago, I had the best baked halibut ever. It was lightly breaded, baked, and full of flavor. Unfortunately, the restaurant has closed, so it was up to me to figure out a recipe. I loved the idea of using Italian breadcrumbs on fish and what could make it better? A tangy, robust tomato bruschetta topping! I love fish if it is crispy. 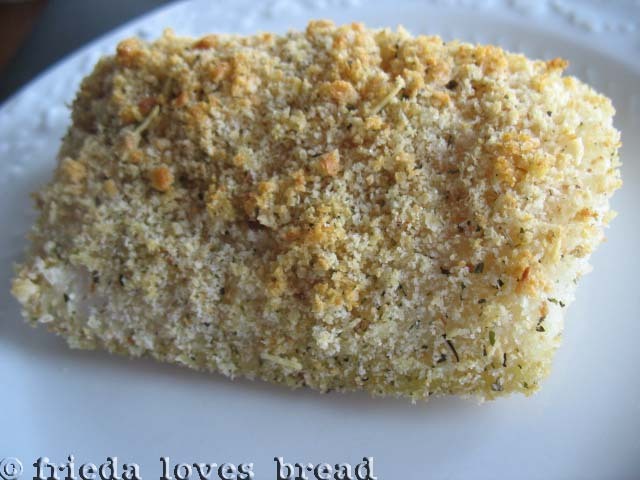 The bread crumbs give this fish a crispy texture without the frying. 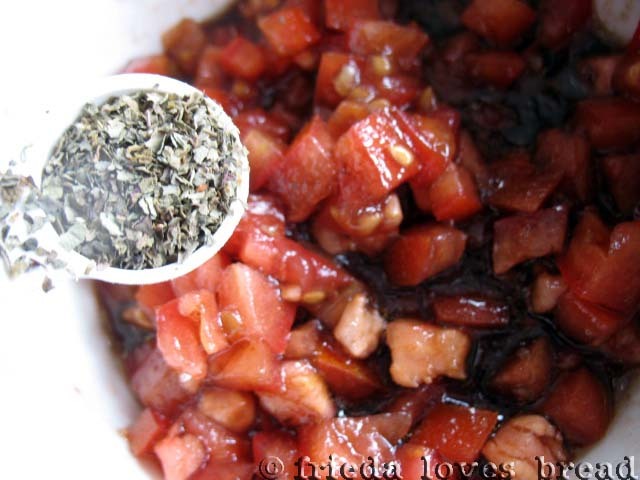 a clove of garlic, extra virgin olive oil, Parmesan cheese and balsamic vinegar are added. Fresh basil is the BEST, but dried is what I have until my herb garden is ready. 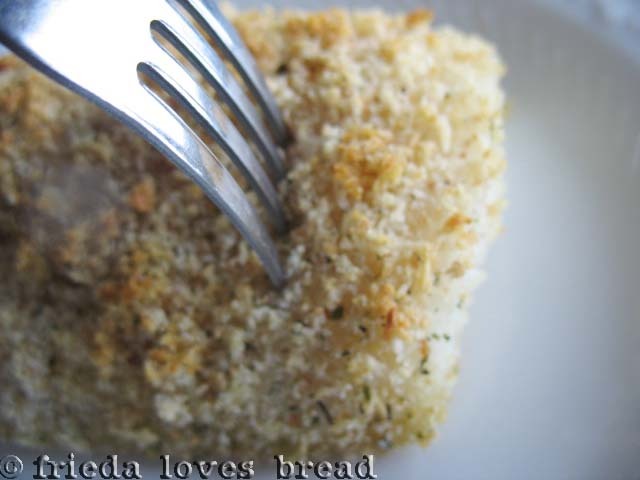 You can buy a box of Italian breadcrumbs, croutons, or make your own. 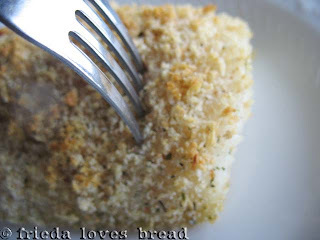 A recipe for homemade Italian breadcrumbs is listed below this post. 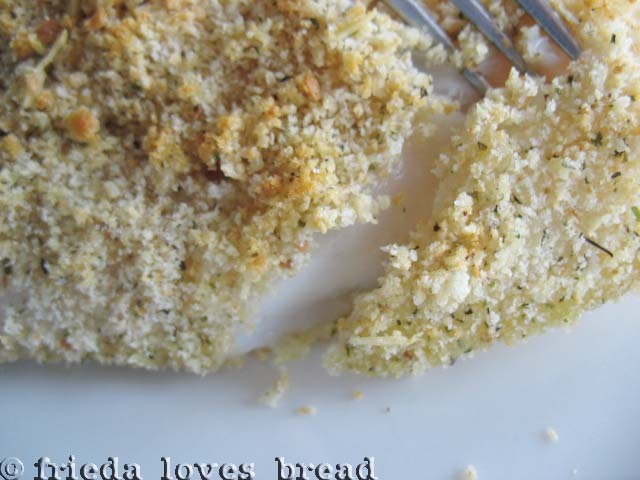 These bread crumbs are great in the Braciole and the Fried Ravioli recipes. I mix the bread crumbs with some Parmesan cheese. Assemble all your ingredients. Fish, bread crumbs, oil, baking sheet. 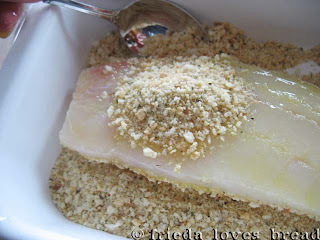 You want your fish to be fully thawed (I put them in the fridge over night). 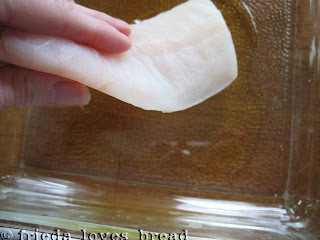 Pictured are individual cod fillets from Costco, but you can use halibut or talipia. The first thing you want to do is pat your fish dry with a paper towel. Dip all sides of your fish in olive oil. 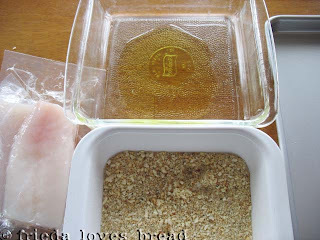 Put it in your bread crumb mixture and cover it well. 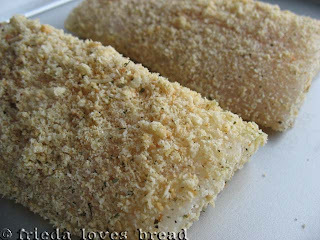 Drizzle remaining oil on baking sheet, and place your breaded fish on top. These are baked for 18-20 minutes, depending on the thickness of your fish. and give the fork a slight twist.... if the fish comes apart easily, it's done. If it doesn't flake easily, it needs more baking time. 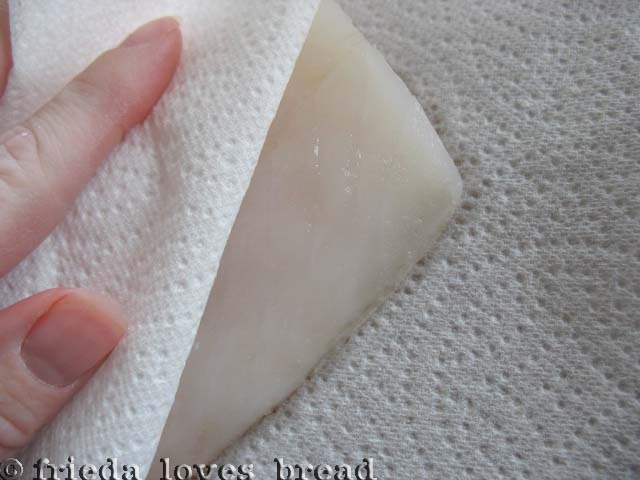 Put it back in the oven and check every 5 minutes with the fork test. 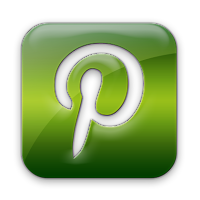 Fish should be a solid color, and not translucent (kind of see-through). 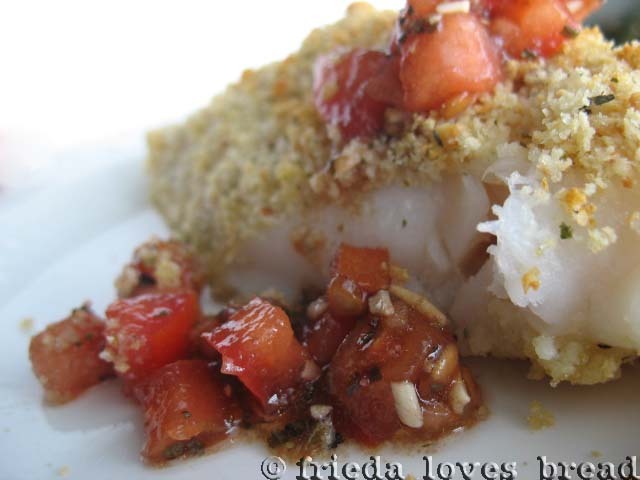 The fish is great on its own, but the tomato topping gives it an extra depth of flavor...delizioso! 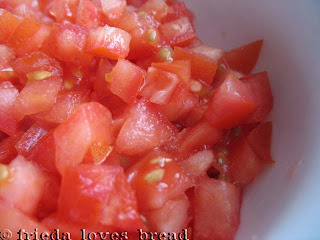 I will try that this friday,sounds delicious,also can't wait for my fresh basil!